Found 5 file extension associations related to Tablet and 2 file formats developed specifically for use with Tablet. 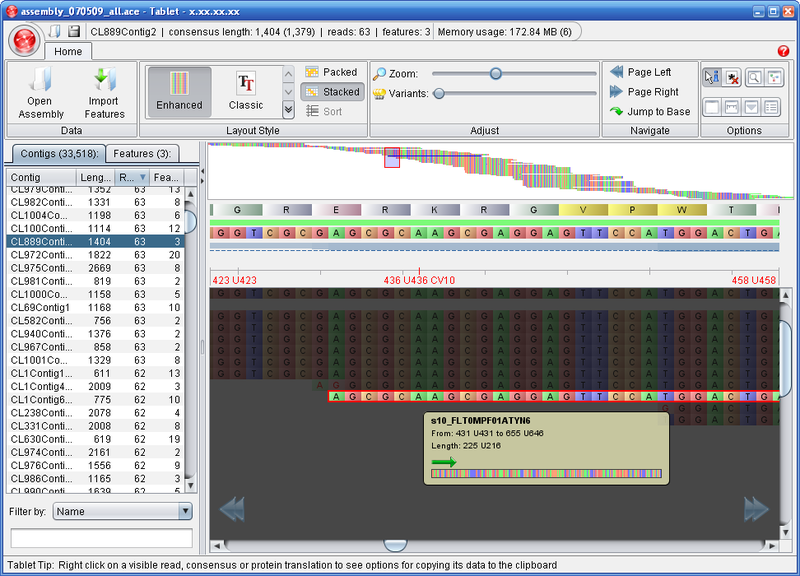 Tablet is a lightweight, high-performance graphical viewer for next generation sequence assemblies and alignments. High-performance visualization and data navigation. Display of reads in both packed and stacked formats. File format support for ACE, AFG, MAQ, SOAP2, SAM, BAM, FASTA, FASTQ, and GFF3. Import GFF3 features and quickly find/highlight/display them. Search and locate reads by name or subsequence across entire data sets. Paired end visualization support (for SAM/BAM). Entire-contig overviews, showing data layout or coverage information. Simple install routine via auto-updating graphical installers. Support for Windows, Apple Mac OS X and Linux, in 32 and 64-bit. If you need more information please contact the developers of Tablet (JHI Plant Bioinformatics Group), or check out their product website.